Zimbabwe's military apparently seized control of the southern African nation overnight, deploying tanks to the capital, taking control of the state-run broadcaster and confining longtime leader Robert Mugabe to his residence. 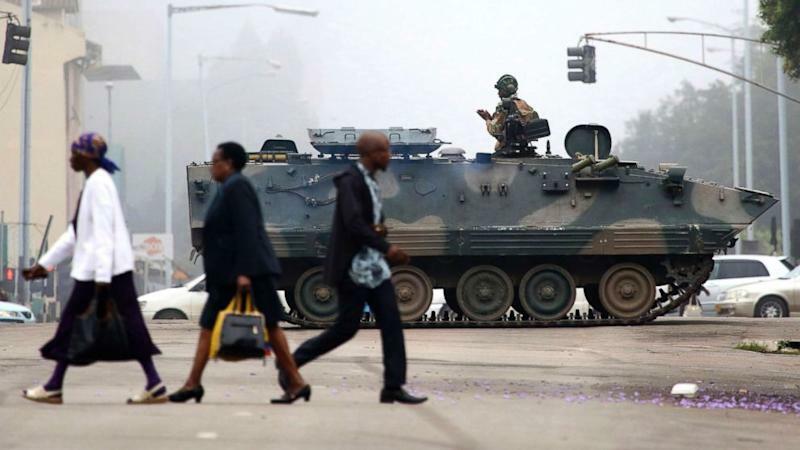 An established Zimbabwean journalist, who spoke to ABC News on condition of anonymity, said there is an increased military presence in Harare, with tanks stationed on the outskirts of the city center. The streets were quiet early Wednesday, but overnight the journalist said he heard the sound of heavy artillery firing from the military vehicles. Meanwhile, soldiers are inside the state broadcaster's headquarters and have told employees there to not be afraid, that "we are here to protect you" and to continue their work as usual, the journalist told ABC News. The journalist noted that Mugabe has had strained relations with the army in recent months, and this activity is an indication of that. Officials, journalists and residents alike are not sure what to make of it, he added. It's uncharted waters for Zimbabweans. Mugabe, 93, has led the country since its independence in 1980, making him the world's oldest head of state. Despite his age and concerns over his health, Mugabe so far has showed no signs of relinquishing his grip on power. In December of last year, Zimbabwe's ruling party confirmed Mugabe as its sole candidate for the 2018 election. 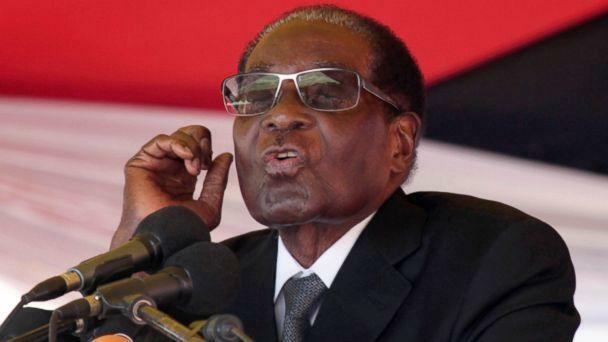 Just last week, Mugabe dismissed his deputy and longtime ally, Vice President Emmerson Mnangagwa, and accused him of scheming to take power, including through witchcraft, according to the Associated Press. Though the ongoing situation bears many hallmarks of a coup d'etat, Zimbabwe's army said on state-run media early Wednesday that "this is not a military takeover" and that the president and his family are "safe and sound." "We are only targeting criminals around him who are committing crimes that are causing social and economic suffering in the country, in order to bring them to justice. As soon as we have accomplished our mission, we expect that the situation will return to normalcy," Maj. Gen. S.B. 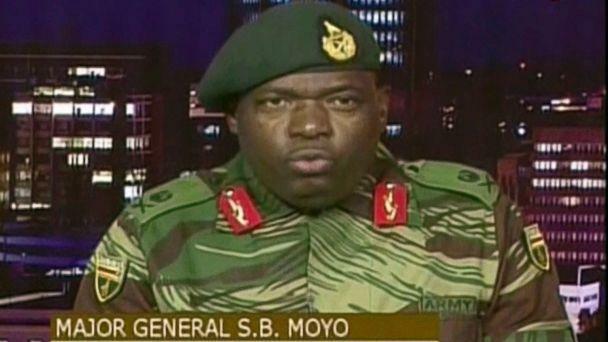 Moyo, spokesman for the Zimbabwe Defense Forces, said in a statement on the state broadcaster. "To both our people and the world beyond our borders, we wish to make it abundantly clear that this is not a military takeover of government. What the Zimbabwe Defense Forces is doing is to pacify a degenerating political, social and economic situation in our country, which if not addressed may result in a violent conflict," he added. Moyo urged other security services to "cooperate" with the army "for the good of the country," and warned that "any provocation will be met with an appropriate response." As the political turmoil continued to unfold Wednesday, it remained unclear whether Mugabe was still in power. The president of neighboring South Africa, Jacob Zuma, said he spoke with Mugabe on Wednesday morning, who told him he was "confined to his home but said that he was fine." Zuma is sending "special envoys" to meet with Mugabe and the Zimbabwean army "in light of the unfolding situation," according to a press release from the South African presidency. The whereabouts of Mugabe's wife, Grace Mugabe, were unknown Wednesday. The U.S. Embassy in Zimbabwe issued an advisory Tuesday night, urging all employees to stay home the following day and warning American citizens in the southern African nation to shelter in place "as a result of the ongoing political uncertainty." "U.S. government personnel have been instructed to shelter in their residences tonight and work remotely from home on November 15. The embassy will be minimally staffed and closed to the public," the U.S. embassy said in its statement. "U.S. citizens in Zimbabwe are encouraged to shelter in place until further notice. Please monitor news and embassy notifications." The United States in 2003 imposed targeted sanctions, a travel ban and an asset freeze against Mugabe and his close associates, citing the Zimbabwean government's human rights abuses as well as evidence of rigged elections. 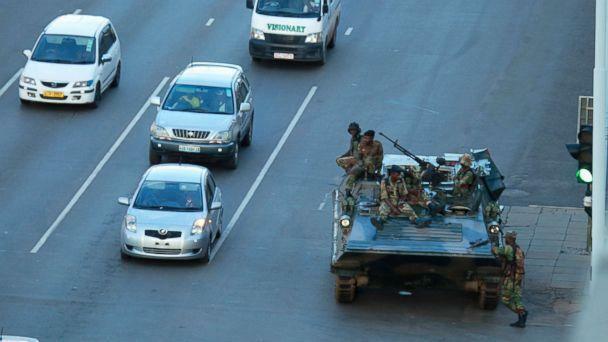 U.K. Acting Ambassador to Zimbabwe Simon Thomas confirmed in a video message posted to Twitter that the Zimbabwean military remained deployed at "strategic locations" around the capital Wednesday morning. Thomas advised British nationals in and around Harare to "stay at home, stay in your hotel room, wait until things settle down a little bit." ABC News' Sohel Uddin contributed to this report.